Good to hear your on the mend Steve. Look forward to the next update. Hey Ya'll, just in case you haven't heard, Boyd alerted us to some changes that will be taking place with SFMA. Just follow the link to the announcement thread. Be aware that, despite my comments, Google+ will be going the way of the Dodo. Boyd is trying to keep the community together but will be introducing some changes for SFMA. The way it sounds, Boyd is going to fold SFMA in to the new website, with the two tier membership. Free and pay, but it sounds like the pay is going to be around $5.00 or less. Don't quote me on that, as I'm just repeating what I've read. If that's all it costs, I blow that much on a donut and beverage for my break at work typically, so i should be able to absorb that. The free membership will still have access, just no video posts and other similar features. No worries, Si. Just wanted to get the word out. I'll get back to the regular thread as soon as Mrs. MSgtUSAFRet stops decorating for Christmas! Please do! I want to see this thing completed! I've been away from the hobby for quite a while but am hoping to get back into it in the new year. I've been looking at some of the current builds going on and I see yours is doing really great! Sorry about your hand. Hope it's coming along nicely! Looking forward to seeing this one on the final stages Steve. DUDE! Welcome back! Thanks for the post! Hoping to get some work done this week! I look forward seeing your posts again! Thanks, Iain! I am too! Just gotta get the ball rolling again! I started looking at my thread and realized that I haven't posted an update or picture in over two pages so I am trying to rectify that oversight. I am cutting masks again. My first question is "Why do I keep doing this to myself?!" and, secondly, "Why hasn't any one come up with some aftermarket masks for this ship?!" Ah, well. 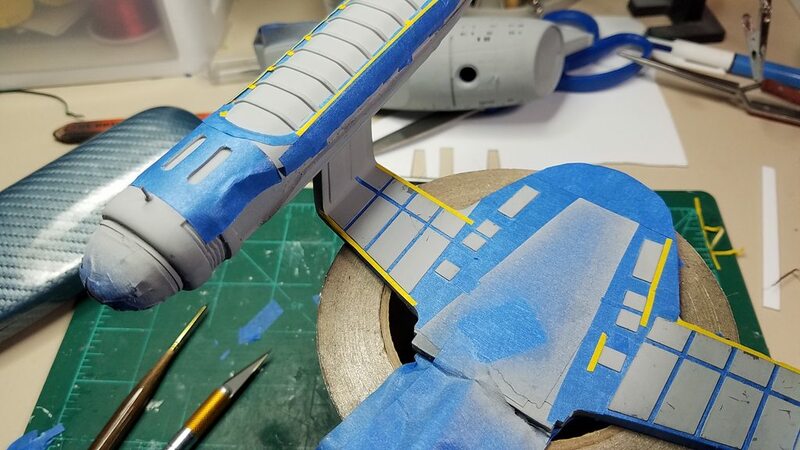 As I have said before, I had to remix some paints so I will have to re-mask the saucer and re-paint it to match the other parts of the ship. But I can go ahead and paint the secondary hull and the engine pylons before I have to tackle the saucer again. Here are a few pics of the masks. 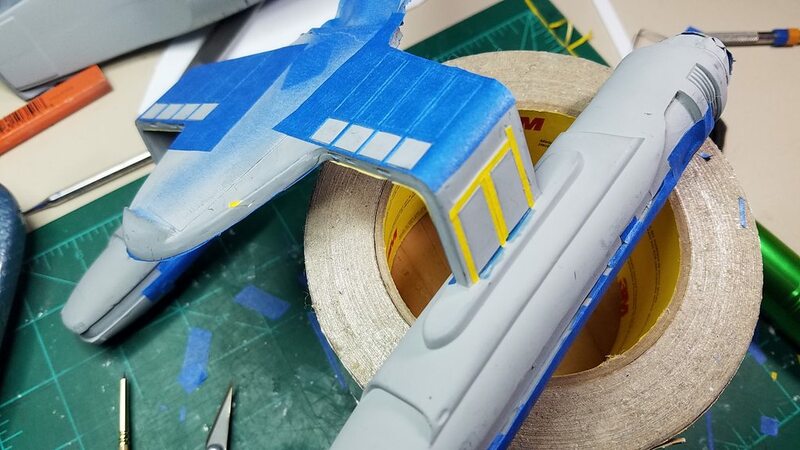 I will have to go back and cover the anterior sections, towards the bow of the ship, again as I cut them all away rather than just the parts I need to paint blue. The interconnecting dorsal - This will have to be blue. 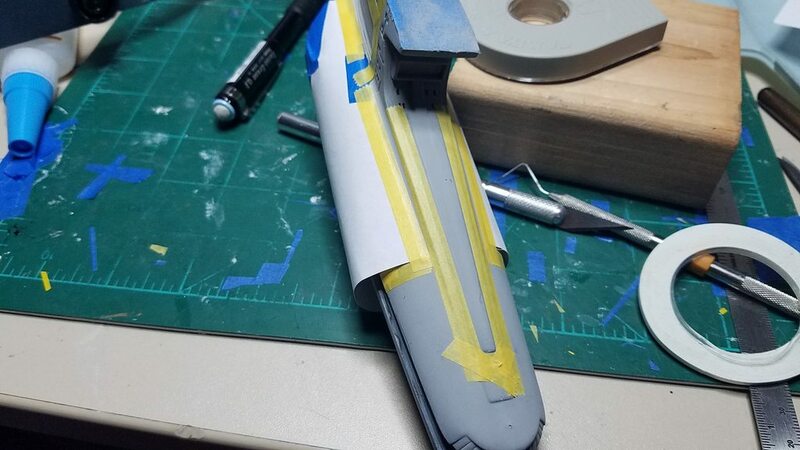 I was going to paint it the darker grey, but figured I needed some blue on the secondary hull to tie the ship together. 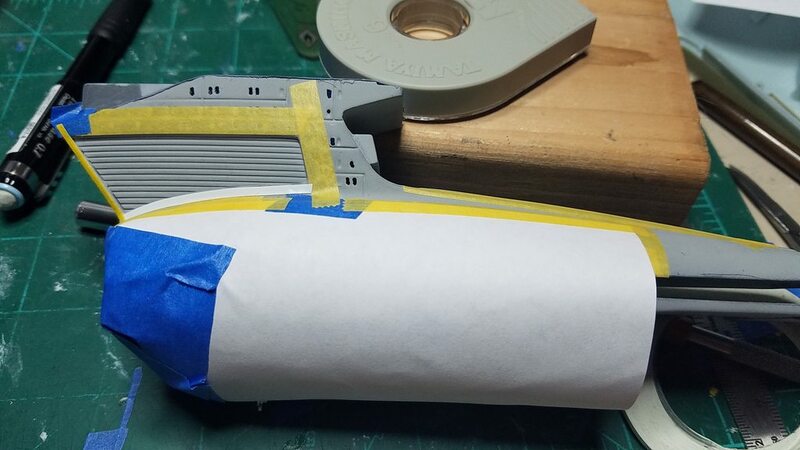 I'm trying to stay motivated for this one, much like James has to for his Mutara Nebula build, as I seem to be having more troubles than it's worth. But I am trying to power through and see what else I can do. Thanks, as always, for your enthusiastic support and your constructive criticisms! Hey Steve. Great to see you back on the line again. Looks like your masks are going to be awesome when you are done. Just have to hang in there. I know this is going to be your best ship you have ever built. There ya go buddy. Oh but the satisfaction of peeling those up and seeing what will surely be an awesome job! I guess nobody makes paint masks because the ship doesn't really have aztecs. Nice to see you back at it, Steve! Homemade masks are a huge pain but yours look great and I'm sure the final result will be worth it.